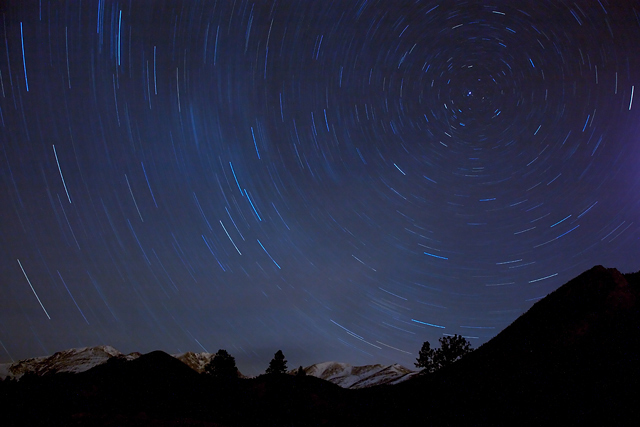 34 minute exposure in the northern mountains of Colorado. I wish so much I could take a photo like this one! BEAUTIFUL!! This is great. Pity the nearest mountains are so dark, but the further away ones really add interest to make for a great shot. Great long exposure, 34 mins, is a long time, I hope you were keeping warm. :). Congrats on your 8th place finish. woo..I feel I am moving along with the stars!!! Congrates on your top ten!! Amazing Canon display of a of earth rotation. You have made an memorable study that will entertain may eyes. Congratulations on your top ten finish. Very nice. I have always liked astronomy shots and this is a great use for long exposure. In fact, I've wanted to try a shot like this for some time, but havent got around to it. I'll be interested to see how you went about it and I am curious if there is anything in particular that you can do to make it work well. Now that's what I call a long exposure. Fabulous effect and lovely photo. I'm a beginner and would love to know more about how you made this immage. CW? Do tell! i have no idea how you did this, but it is very cool. great shot of the stars, I would have liked to see some detail in the forground, well done. I've always wanted to try this. Very nice! Great shot, i wish there wasn't so much light pollution wherre i live. Very nice. I love images of star trails. Proudly hosted by Sargasso Networks. Current Server Time: 04/26/2019 01:43:03 AM EDT.